The debate about derogatory representation of Hindu faith in Californian schools is making big news and has taken SM by storm. As usual, Hindus in India are up in arms and feeling hurt on how could those racist Americans treat Hindu civilization with such contempt. But it is not what the Americans teach in US is a problem, it is what the Hindus learn in India is a problem as it is creating a society disconnected from its roots. This makes us vulnerable on the world stage because we ourselves have failed to teach the right history to our generations. It’s not the superficial edits in California text books that threaten us. We are a nation of 1.3 Billion and would hardly get affected by small events in US. But what history do we teach our kids? It’s some Marxist mumbo-jumbo about how we got independence through non-violence in 1947 and everyone lived happily ever after. All real revolutionaries like Tilak, Bose and Savarkar who actually fought and won us our independence are shown as extremists. This is done with great foresight to intellectually disarm us. So Americans can do whatever they want in their country, it’s the American influence on Indian curriculum that should bother us. Unfortunately BJP hasn’t taken any steps to amend our faulty syllabus so whenever a foreign power tries to twist our history, it makes our people more vulnerable to subterfuge. 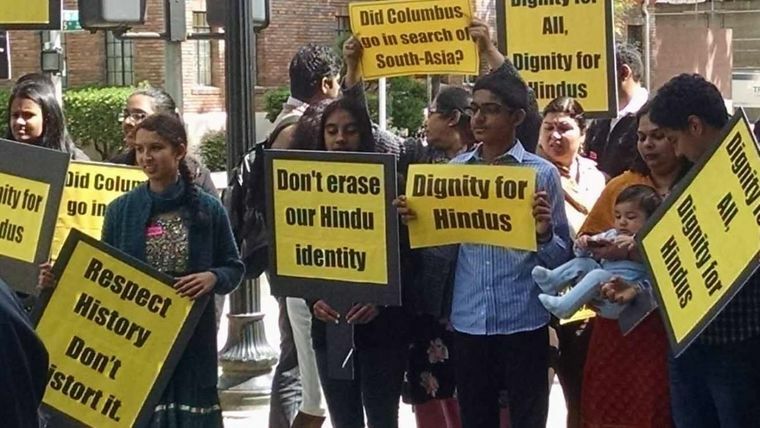 Hindu groups always protest against foreign narrative, but they also have some blame to share because they have failed to come up with their own narrative. They just oppose what they think is wrong, while not spelling out what they think is right. Imagine, if US as a nation and the evangelists as a religious group have so much tenacity to spend time and money and allot research scholars to create a narrative about India (which is suitable to them) then why weren’t we able to do it for ourselves even 7 decades after independence? Those who don’t have a legitimate cause to research about India are going ahead with it and those who do, are simply satisfied with signing online petitions and writing angry tweets. How come Russia, China, Saudi Arabia never face this problem which India so frequently faces? It has been in our cultural DNA to not document historic facts and weave them into a coherent narrative. We are happy with the “sabh chalta hai” attitude so someone else comes and messes it up. We all want to piggyback on Rajiv Malhotra now rather than building upon serious scholarships in other fields. We have been colonized once for the same reason, but we still didn’t learn anything. This is not just about past, this complacency is a cultural trait that transcends a large portion of our history. And we are doing it even for our recent history. Compare the number of books, documentaries and movies that Hollywood made about world war and holocaust? Now compare that to how many movies we made about the wars we fought and won after independence in 1948, 1965, 1971, 1999? It is in our nature to not document facts and to not propagate our own narrative. This is why foreigners take the liberty to do it for us, and when they do, they do it in a manner which suits their agenda. Why are we surprised? There’s still time, we should build a coherent narrative about civilizational nationalism (no ‘unity in diversity’). Trash the nation-state narrative and build a civilizational narrative and include it in our school curriculum such that the historic narrative is not lost. India wasn’t born on 1947, we are a civilization. The unity in diversity narrative implies that we are essentially different people who have come together in a confederation loosely bound by a political idea, and not by common civilizational values. By corollary this implies that if a certain group were to lose faith in this idea then they can walk out of the alliance any time like in 1947. This introduces a fault line right in the core ‘Idea of India’ and makes us perpetually vulnerable to needling from hostile forces. These core facts should be added to the constitution itself and frozen in time so that no government can dare to fiddle with our syllabus in the future for political gains. Once this is done, we don’t have to worry about what foreign schools teach about us i.e. Bharat.